Sungchang supplies all sorts of plywood ranging from building materials, industrial materials, and interior materials. Manufacturing some 150,000㎥ of plywood per year, we lead the Korean wood industry. Plywood is a versatile material that is primarily used for basic construction. It is a material that serves as a building block to our way of life. Sungchang manufactures 150,000㎥ of plywood per year, cementing its place as an industry leader in Korea. We recently began manufacturing environmentally friendly products, marking our commitment towards manufacturing more healthy and green products. Plywood is an all-natural material, one that minimizes wood's shortcomings and maximizes advantages. Plywood is layered veneers of wood that is created by processing wood into thin veneers and gluing them together. Some plywood has special cores. It retains all advantages and quirks of natural wood while gaining superior strength and warp resistance, leading its adoption to construction, interior, and industry as a base material. E1 rated eco-friendly plywood that uses soft wood for natural texture. Colored plywood with 8 colors that uses all-natural materials in all stages of its manufacture, from base wood to UV painting. SE0 rated green plywood that accentuates unique natural Douglas fir texture through brushing process. Plywood that accentuates unique natural Larch texture through brushing process, giving it beautiful volume. Interior plywood that retains sophisticated and delicate natural stripe patterns. 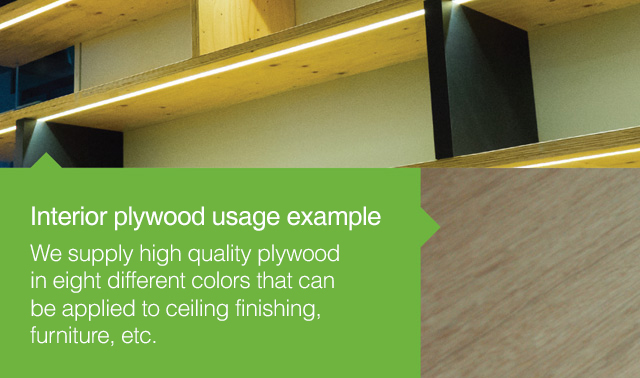 Health-focused plywood made with Japanese Hinoki tree, a tree with most phytoncide content. Using Urea–formaldehyde (UF) adhesive, this plywood is widely used for finishing interior construction. Solid adhesion grants this plywood superior strength and minimal warping. This plywood is created by gluing Tego Film on the surface of a high-quality Tego board, allowing seamless texture on a concrete. Used for flooring on large vehicles such as buses and trucks, this plywood uses Eco-friendly adhesives. Plywood with high thermal conductivity used as flooring for heated floors. Plywood with high strength that is used for working platforms when building LNG ships in large shipyards.